When average users think of mobile devices, they usually imagine Apple products — iPhones, iPads, iTunes, Apple TV, the ubiquitous App Store, and the very new Apple Watch. Apple’s done such an excellent job at branding and aligning themselves with emergent technologies that it’s easy to forget that they’re not actually the number one operating system — that title goes to Google and their Android OS, available for smartphones, tablets, cars, televisions, and wearable gear. Much has been said about Android’s rise to market share dominance, but Apple iOS applications are still a significant force to be reckoned with. 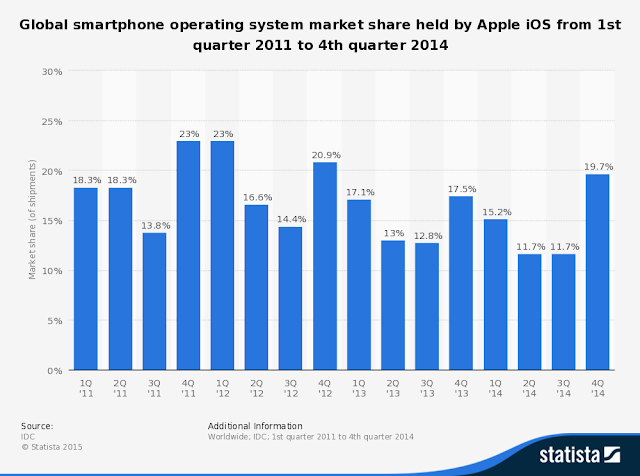 As the following graph indicates, the fourth quarter of 2014 saw Apple holding on to about 20 percent of the global smartphone OS market — this is nothing to scoff at, as this means they still control one fifth of a multi-billion dollar industry (and one that’s predicted to reach $77 billion by 2017). It should also mean that if you want to continue optimizing your chance for growth, you’ll ensure that your newest and most exciting mobile applications are available on Apple products. In order to do so, it’s in your best interests to work with the finest application development companies in the industry. But what does this mean when it comes to iOS apps? With well over 1.2 million apps available in the App Store, it’ll be tough work differentiating your product and standing out from the competition. Your app has to be released strategically or else risk being swallowed up in a sea of choice. A superior and innovative app development company knows all the ins and outs of market delivery, how to tailor an application to a particular demographic, and how to take advantage of real-time market analytics to better optimize your app for your intended audience. This kind of personalized support is available from companies offering in house support. In house developers often embrace agile processes that begin with personalized consultations, continue as sprints, scrums, triage sessions, demonstrations, integrated UI/UX development, and continual communication with the client, and end with support and delivery to the App Store with the added bonus of maintenance and regular updates to the platform. That’s customized, personalized, painstaking attention to your objectives — and you’re only going to get it by employing the best, most professional organizations you can find. If you want to embrace Apple TV and iOS innovations like Chromecast, location, tracking, or beacon-related applications, then hiring fly-by-night companies or using free online builders won’t serve you well (or they simply won’t work for you at all). Look for companies that have extensive histories developing iOS apps for major businesses, not-for-profits, and other organizations. Look for testimonials, case studies, a history of successful projects, and awards. To give you a good example, if you check out Clearbridgemobile.com/case-studies/, you’ll see how the innovative app development company Clearbridge Mobile has a page of their website dedicated to case studies of recent projects, clearly demonstrating how they’ve tackled difficult concepts and produced successful products. That openness, track record, and dedication you see from Clearbridge should set the bar for any developer you work with (but sadly, you’ll find many companies falling short, even when your next iOS project depends on the highest levels of attention and skill). 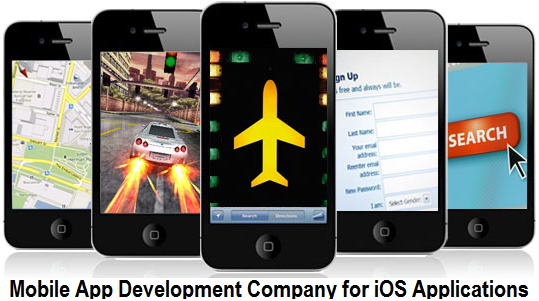 With a top-tier Apple application, you have the potential to reach millions upon millions of users. The last thing you want to do is gamble with how you penetrate and dominate the iOS market. Working with a diverse and trailblazing mobile app company is your only guaranteed way to find success in such an exciting but risky endeavour—and depending on the company and your vision, potentially worth every dollar.